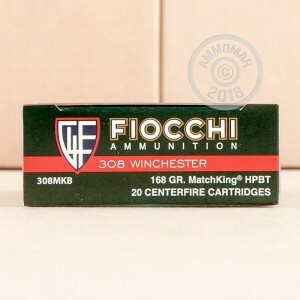 Get ready for your next match with this competition-grade .308 Winchester ammunition from Fiocchi. These cartridges are reasonably priced yet satisfy tight tolerances for precision ammo and deliver extremely consistent ballistics. Each cartridge in this case of 200 fires a 168 grain Sierra Matchking bullet at a muzzle velocity of 2,650 feet per second. The MatchKing is a streamlined, highly efficient competition projectile designed for accuracy above all else. 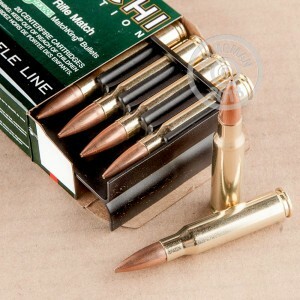 This ammunition is loaded by Fiocchi of American in Ozark, Missouri and uses non-corrosive Boxer primers. Pick up this case or any other items totaling $99 or more from AmmoMan.com to get free shipping!